A staple on most bar snack menus, Buffalo wings are the perfect accompaniment to a cold beer or as a tasty starter. Tangy, salty and spicy with a rich blue cheese sauce they are always a crowd pleaser. 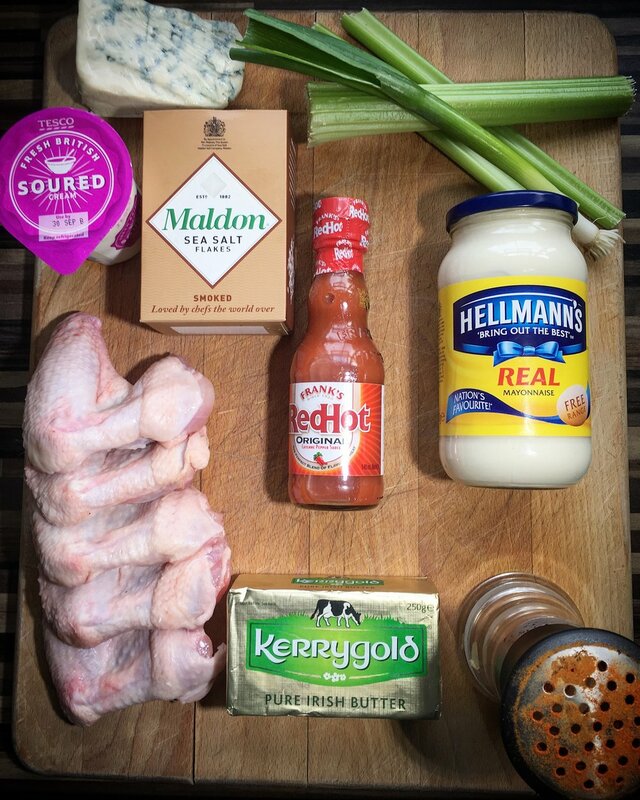 First up prepare the blue cheese sauce which is only a matter of mixing all the ingredients together and placing in the fridge until the wings are served. The key to a good wing is to try and get them as crispy as possible. In order to achieve this I placed them in an oven for 1 hr at 110c° with a hefty sprinkling of sea salt. This method serves two purposes in pre-cooking the wings as well as drawing out the excess moisture held in the skin. After 1hr in the oven the wings should feel dry but not crisp, the salt will have also done its job in helping to draw out the moisture. If you don't want the wings to be overly salty shake off the excess before frying, I didn't bother. 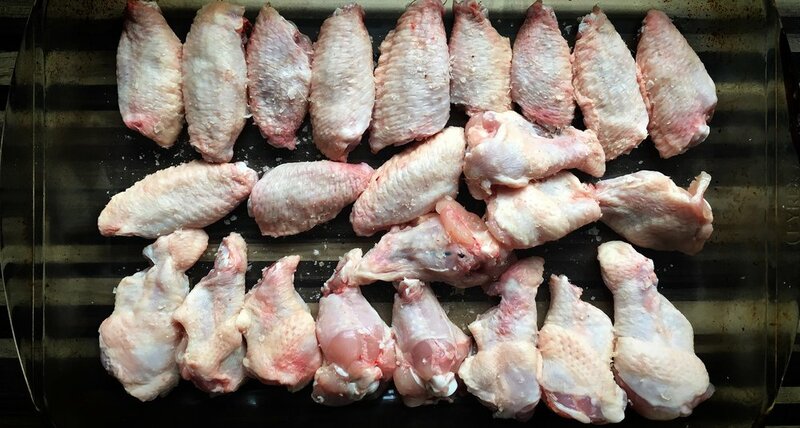 To fry the wings I used vegetable oil which works well. Any oil with a high smoke point will do like sunflower, peanut or canola but stay away from olive oil which will burn fairly quickly and turn the wings black. I used a deep frying pan and preheated the oil for around 5 minutes. Add the wings and fry for roughly 10 minutes stirring occasionally until golden brown and crisp. While the wings are cooking add the buffalo sauce ingredients to a pan and place on medium heat. Simmer while the wings are frying until a semi thick consistency is reached and the vinegar taste has mellowed slightly. Once the wings are cooked through and golden brown remove and place in a bowl with some kitchen roll to absorb the excess oil. My preference is for the wings to be only slightly coated with the sauce with no excess at the bottom of the serving dish but add as little or as much as you desire. Remove the cheese dip from the fridge and serve with celery sticks which works excellently in adding freshness and balancing out the richness of the buffalo sauce.